This weekend i visited the mini maker fair in Bristol (http://makerfairebristol.com/). Among the many interesting things i noticed there was a big Polargraph plotter running (http://www.flickr.com/photos/anachrocomputer/8589092188/in/pool-mmfbrs2013) . I have been toying with the idea of building a Polargraph robot for a while and seeing this one has motivated me to finish my own. 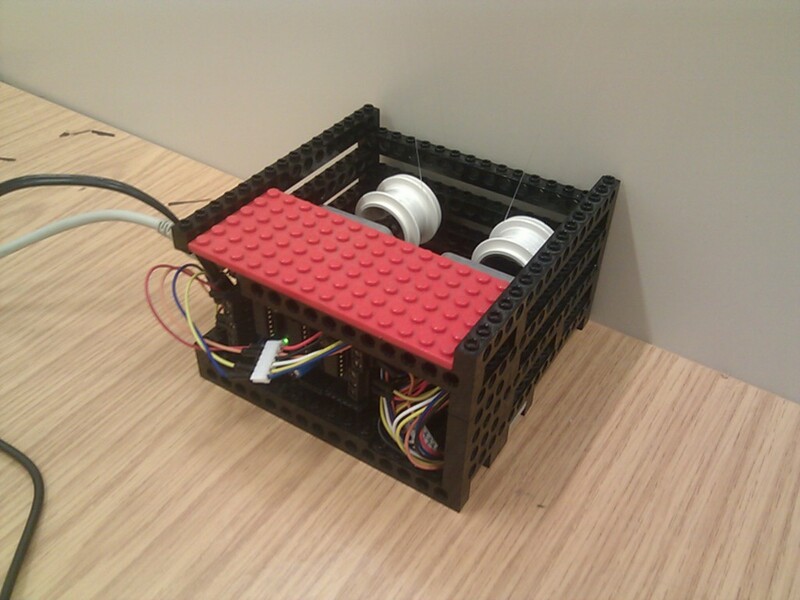 This is Just a first prototype that i have made out of Lego as a “proof of concept” model. Unlike most polargraph that have the motors on either corner of the work-space, i have decided to house Both motors together along with the electronics to make this a self contained unit. I have also decided to reel up the cable onto spools so that i don’t need a counterweight like some polargraphs use. The cables are run to a pair of pulleys then down to the pen holder. 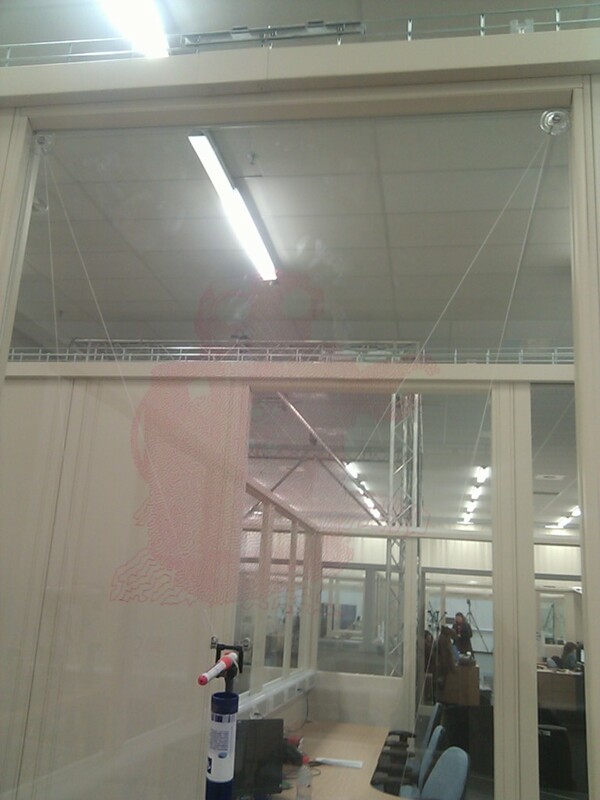 the pulleys are on suction cups that can be stuck to any smooth surface such as a window, whiteboard or some walls. This allows for a much more portable and re configurable device than many other polargraph systems. At the moment i have just made a basic pen holder but i want to add a servo to this to alow for raising and lowering of the pen. I have only done some basic vector plots and these have turned out well. so far i’m pleased with the results although i think i need to get hold of a color that stands out a bit better than the red i’m currently using. A polargraph is a simple machine, that draws picture using a pen that hangs between 2 fixed points. It works in a similar way to a pen plotter however it uses a dual-polar coordinates system, rather than the regular Cartesian system (xyz) like most CNC’s use. Using polargraph to create a more dynamic work space. On a computer most people have a desktop wallpaper, this image often reflects the person who owns the computer and offers them the ability to customize there work environment. People often update the wallpaper to show current interests or reflect there thoughts towards something. This is very similar to the way posters are used to decorate an area. They reflect the interests of the owner whether this is in a cubicle, a bedroom or advertising in a public space. The only problem is that a poster is always the same, it eventually gets old like your computers wallpaper. Imagine being able to change your work area in the same way you can update the image on your desktop. 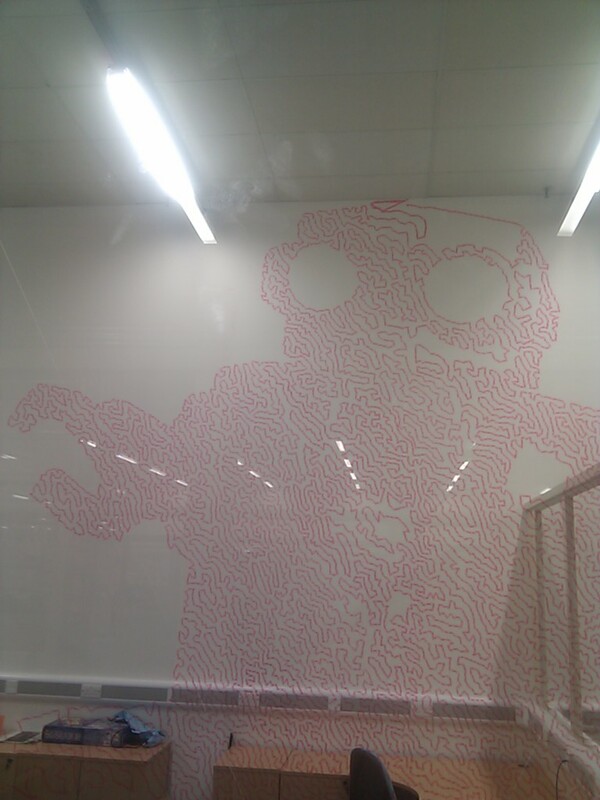 Whenever you fancy a change in decoration you just hit print and redraw your entire wall. This is what i hope to achieve with my polargraph. I want the ability to update my cubicle on a regular basis depending on what projects im working on and what my current interests are. I want to be able to put vector graphics, text, pictures or even the latest XKCD directly to my office wall. This makes my office space dynamic it can also be used to help me with my projects when needed. For example whilst building a PCB i could print the schematics to my wall so that i don’t have to keep the file open on my computer. Or whilst working an a design project i could keep a current cad model on the wall so that i know what iv done and what i still have left to do. This could even be automated to update daily, each night downloading the next days weather forecast, news headlines or calender appointments and rendering them to the wall overnight. When i arrive at work my cubicle will already show me what my day will be like and the things i need to do. My wall could contain to-do lists synced to group task management systems like Trello or keep me updated with UWE’s RSS feed, updating live as each new post comes in.